There are two different varieties of Skunk that inhabit Virginia - the Eastern Spotted Skunk and the Striped Skunk. 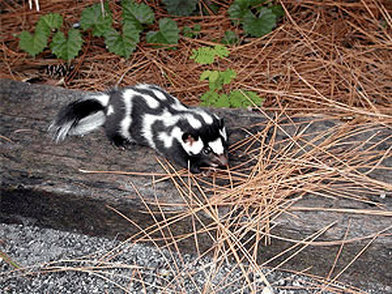 They can be identified most easily by their markings, which are typically black with white spots or stripes. Most skunks are roughly the size of a house cat or smaller. They are nocturnal and are rarely seen during daylight hours. Skunks eat bees and their honey, birds and their eggs, insects and small mammals such as mice, moles, chipmunks and rats. They also eat fruit and other vegetation. Why do Skunks get into yards? Skunks are scavengers. They can be attracted to backyard vegetable gardens, dropped seed from bird feeders, and even trash in your garbage cans. Skunks also like to eat insects and small mammals that are commonly found outside, and like to dig or burrow under porches and decks to make dens. 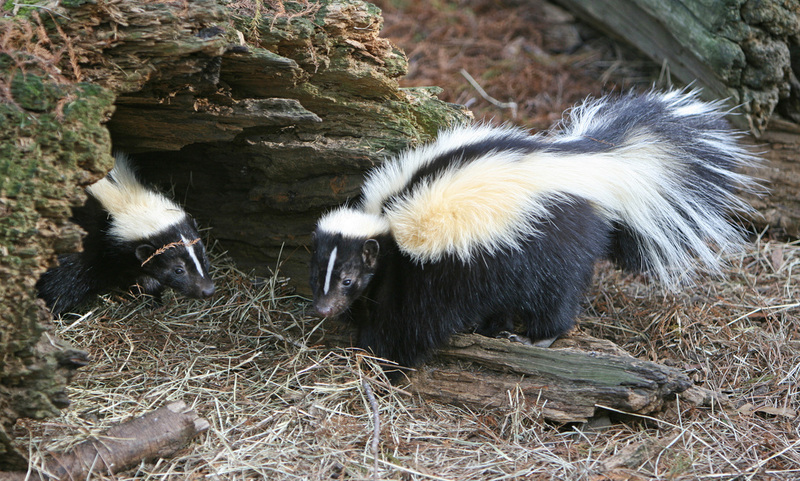 While Skunks can help control the population of other backyard pests, they can easily become a problem due to their distinct smell and their potential for carrying rabies. You can take certain measures to prevent Skunks from making a home in your yard. Fill in or block holes under porches, decks or other hiding spots; fence in gardens; and keep garbage cans sealed tightly. Give us a call or shoot us an email and we will be happy to help you with your Skunk control problem! Here are the two types of Skunk found in Virginia, the Eastern Spotted Skunk and the Striped Skunk! Click here to learn more about snakes!